House flags of Canada Steamship Lines Inc. This site lists the various firms amalgamated in 1913 to form Canada Steamship. Incorporated 17 June 1913 as Canada Transportation Lines, Limited. Acquired corporate name on 4 December 1913 by merger of the Northern Navigation Company, the Richelieu & Ontario Navigation Company, Compagnie du Richelieu, Canada Interlake Lines, Ontario and Quebec Navigation Company, Lake Ontario & Bay of Quinte Steamboat Co., the Quebec Steamship Co. and a group of subsidiaries of the Richelieu & Ontario Co. In 1925, Canada Steamship Lines bought Davie Shipbuilding and Repairing Co. Two years later the company owned 115 ships. According to Lloyds it should read Canada Steamship Lines Inc. being formed as Canada Steam Ship Lines Ltd. in 1917, becoming Canada Steamship Lines (1975) Ltd. and then in 1981 became The CSL Group but retaining its identity as Canada Steamship Lines Inc. The third version shown by Ivan is shown by Brown editions from 1926 to 1958. The second by Al starts with Stewart 1953 [ste53] and is picked up by Brown from 1978. The first version by Jorge is the current one. Horizontally divided red-white-red with a vertical blue stripe in the middle. Source: Znamierowski shows p. 244 a plate of houseflags of North and South American shipping companies, dated 1933. The original source is Lloyd Reederei-Flaggen der Welt-Handelsflotte [Lloyd Houseflags of the World Merchant Fleet], Bremen (Germany). The caption of the original plate says 'Lloyd Zigaretten + Bildersammlung: Reedereiflaggen', so the 'book' is an album for cigarette cards. 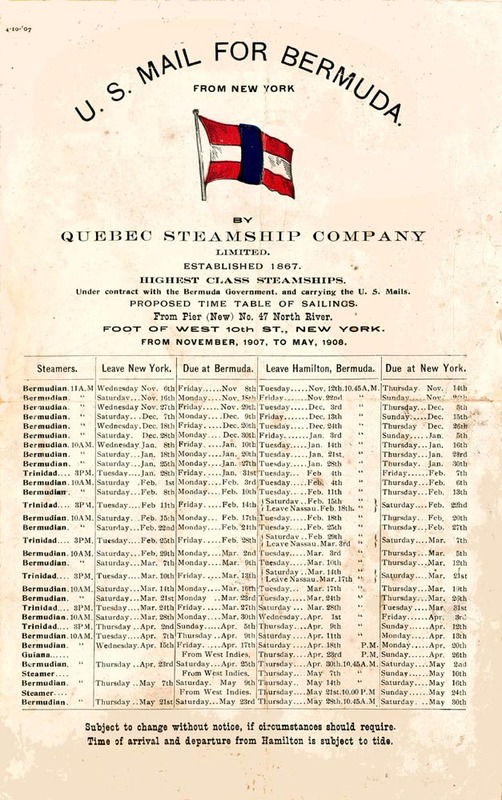 Shown on the Maritime Timetables site, the flag of the Quebec Steamship Co., a horizontal triband red-white-red, a blue vertical stripe (having the width of the others) laid over them in the centre. Document "Sailings November 1907-May 1908 (issued October 4, 1907)". I understand this firm was previously called 'Quebec and Gulf Ports Steamship Company' (founded 1867, renamed 1880). Famous for its travels to Bermuda. Taken over by Canada Steamship Lines in 1913, then sold to Furness Withy in 1919 and dissolved in 1921. The steamship pass in question shows a long blue swallowtail bearing a red-and-white device I cannot quite distinguish. For some information on the firm – sometimes called the ‘Bay of Quinte Line’ – see the Archives & Collections Society in Picton, Ontario. 1893 is given as the foundation date and a number of destinations such as the Thousand Islands and the route between Port Hope or Cobourg, Ontario and Rochester, New York (US). The Company seat was Kingston, Ontario. In all, this firm existed for a mere twenty years. In my message of 18 Sept. concerning Canada Steamship there was a quote listing this Montreal-based company as one of many to merge into the current firm. Its precursor, the Compagnie du Richelieu, already used steam on the Richelieu River in 1845. When this company merged with the Canadian Inland Steam Navigation Co. (aka Canadian Navigation Co.) in 1875, the Richelieu & Ontario Navigation Co. was born. Active on Lake Ontario in passenger transportation and offering tourist cruises to the Thousand Islands, and the Saguenay (from 1886 on). The Rochester & Lake Ontario Navigation Co., an American firm founded in 1875, was absorbed after only a few years (not to be confused with the R&LO Steamboat Co. of a decade later). In 1911 (but another source says 1886? ), the St Lawrence Steamboat Co. (aka Molson Line), once a fierce competitor on the St Lawrence River, was taken over as was the Northern Navigation Company. In 1912 it was the Thousand Island Steamboat Company’s and the Niagara Navigation Company’s turn to be absorbed. Finally, in 1913, this rather hungry but no doubt successful firm merged others to form Canada Steamship Lines. Apparently the R&O house flag was used for some time after the foundation of Canada Steamship, representing the ‘Richelieu & Ontario Division’ (see second poster). In 1899 J. H. and H. Beatty, owners of the Lake Superior Line (founded 1870) later to be named the North West Transportation Co. of Sarnia (aka Beatty Line, 1882), merged their firm with the Great Northern Transit Co. (aka White Line) and named the new company, Northern Navigation Co. of Ontario Ltd. That same year, the North Shore Navigation Co. (aka Black Line) was bought as well. Under the slightly different name of Northern Navigation Co. Ltd this firm became the largest passenger and goods transporter on the Canadian part of the Lakes. J. Playfair, a major investor, was able to bring about the merger of Northern Navigation with his Inland Lines Inc. and the Richelieu & Ontario Navigation Co. in 1913, a year known for the further establishment of Canada Steamship. As in the case of Richelieu, the company name was retained to some extent but the last ship was retired in 1949 after which Canada Steamship was no longer to carry passengers. The house flag had a red cross throughout; the upper hoist and lower fly quarters were white, the other ones blue; letters N and N were placed on the upper quarters, and C and O on the lower, all counterchanged. Caption: Northern Navigation Co. Officials / March 1905 / St. Paul Street Collingwood Ontario. An e-text, Barlow Cumberland’s A Century of Sail and Steam on the Niagara River, contains valuable information on the company – and a good many others too, of course. Originally published 1911. Starting out in 1898 with a trip to Hamilton, the company met with stiff competition operating a route linking Toronto, Niagara, and Hamilton. (As to competition, see Ch. 9 about “ticket scalpers” or how to promote Toronto.) In the following years, important – even vital - railway connections were obtained, more ships added to the fleet and more towns sailed to. In 1911, Niagara Navigation - commonly named the Niagara River Line and having become a major player - took over the Hamilton Steamship Co. and the Turbine Steamship Co. but was itself acquired by Richelieu and Ontario Navigation Ltd in 1912, soon to be merged with other companies to form Canada Steamship Lines Inc. (1913). This page (hhpl.on.ca) shows a lot of ships but is, at least to my eyes, not very informative as regards flags. There is this page (toronto.ca), however, showing a 1911 brochure (image clickable) with the house flag. The flag appears to have been modeled on the Danish one, bearing a black rectangle in the cross’s centre with a white capital ‘N’ on it. Furthermore the flag seems to be very long, tapering away to a point; my impression is that the image is somewhat romanticized and another picture would be welcome.